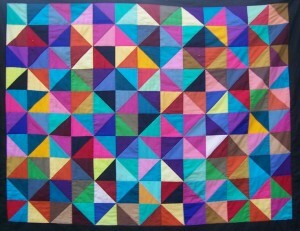 One of the largest forces of inspiration in quilting is the work of the Amish people. These women have been creating exquisite quilted masterpieces for two centuries, possibly even earlier! Their original patterns; the double wedding ring, tree of life, Dresden plate, log cabin and star of Bethlehem (to name a few!) have been used in quilts made all over the world. The Amish have truly had a profound effect on American and International quilting. The Amish have a strict lifestyle and use limited man-made constructions. If someone wants to use something from “the outside world”, they typically bring it to the church or into the community and the elders will discuss whether the “tool” will benefit their society and whether a man could do the work instead! As a result all Amish quilts are hand sewn and hand quilted. There is no machine sewing at all! Traditionally the Amish farm their land to only provide enough food for their families and communities and nothing was sold for profit. Their land is usually small due to that fact that all the work has to be done by hand as they will not use modern farming machinery. These days, Amish quilts serve as more than as practical bedding. Many Amish and Mennonite women open their homes like a small shop and now invite the public in. This is done to subsidise their family’s income. 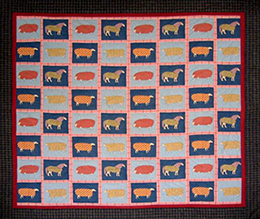 Check out our section on amish quilt patterns for help on making your own Amish-style quilt. The Amish began to quilt as a way for frugal housewives to use leftover scraps of material and fabrics. However not only did these “frugality” quilts serve a functional purpose, they became a work of art and a major form of entertainment for women. 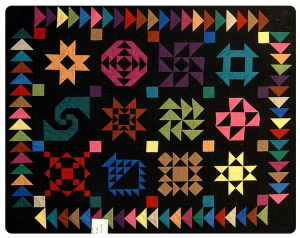 These quilts reflected the sober Amish lifestyle, their humility and sense of community. The quilting is done in groups and is a time for women to catch up and chat about homemaking. It is also a time for the elders to teach the young girls their sewing skills and talk around the quilt frame. 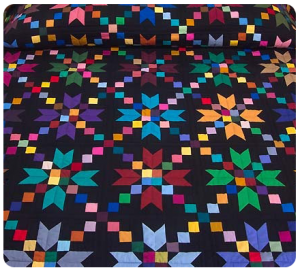 Amish quilts are known for their simple and striking designs and their intricate quilting. The solid color theme that is traditionally used in their clothing, also runs through their quilts. The fabric bases are usually pure plain and dark colors like black, blue, purple and dark red, leaving out the lighter colors like orange or yellow. These colors are then mixed with a smaller amount of white.